"Normal at Any Cost" is the story, told decade by decade, of medical attempts to tinker with one inherited characteristic: height. It reveals the way drug companies redefined normal in order to expand markets, and how the best motives and worst motives combined to result in widespread experimentation on children. We think the temptations to tamper with heredity are just beginning. "Sobering story of what parents, and doctors, will do to help short and tall children become 'normal'...Through the stories of patients and scientists in the United States and abroad, the authors examine the rise of the vast growth-hormone industry, which skyrocketed in the '80s when Genentech developed a biosynthetic hormone. By the '90s, many children whose bodies produced growth hormones were receiving still more by prescription, despite the fact that the long-term safety and effectiveness of the drugs remained uncertain. Meanwhile, complications continued to surface in women who took DES years ago. The authors question the motives of all the key players—parents, doctors, drug companies—and note that there have been many more incentives to encourage treatment with hormones than to study the drugs' long-term effects. 'Once a treatment exists, its existence becomes a reason to use it,' they lament. By librtea- "...Initially, doctors only treated children whose hormone levels were out of normal range, yet eventually they began treating children who were healthy and developing within the norm, but whose parents wanted height adjustments for social / cultural reasons. In the Introduction, the authors note that they are not trying to "discourage a parent from taking a poorly growing son or daughter to be examined by a doctor. Growth is the primary indicator of health in a child...[but] medicine can [quickly] move from curing disease, to treating disability, to leveling disadvantage, to satisfying desires for perfection" (p. ix). Through the stories of the children, who are now adults, readers learn of the lasting physical, psychological, and emotional impact of this medical application on their lives. 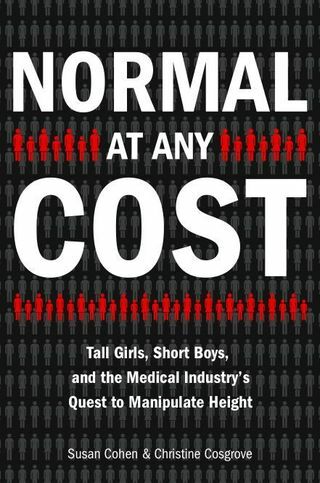 "A fascinating history of the medical community's manipulation of height and its effects, Normal at Any Cost asks its readers to consider the line where the extremes on the spectrum of what is normal cross over to pathology. As interesting as the individual case studies were, the overall theme of "normalcy" and its subjectivity and changeability over the years holds the book together and challenges the reader's own beliefs." LISTEN TO PODCASTS about "Normal at Any Cost": Podcast: KCBX "An Evening With..."
Psychology Today: Genetic Crossroads Blog about "Normal at Any Cost"